Andrew V. Schally, Ph.D, MDhc (Multi), D.Sc,hc. 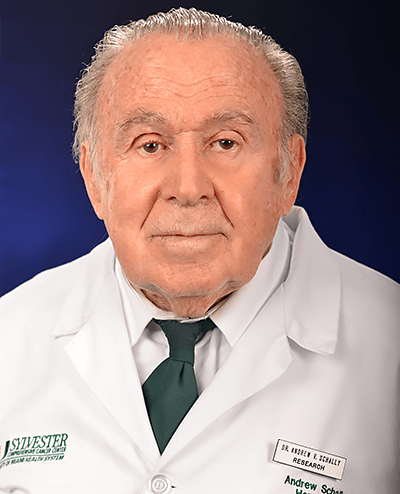 Andrew Schally, Nobel Laureate and Distinguished Medical Research Scientist at the Department of Veterans Affairs, Distinguished Professor of pathology at the University of Miami, and chief of the Miami Veterans Affairs Medical Center Endocrine, Polypeptide and Cancer Institute. Schally received the 1977 Nobel Prize in Physiology or Medicine and was elected to the National Academy of Sciences in 1978 for his discovery of hypothalamic hormones. Subsequently he pioneered the application of analogues of hypothalamic hormones to cancer treatment, including the therapy of prostate cancer with agonists of LHRH used worldwide. Schally holds 32 U.S. patents licensed to 5 companies and is author or co-author of more than 2,400 publications.